This just in! Anna Netrebko will appear in a new DVD release of Anna Nicole, in a production originally deemed too audaciously boobtacular for commercial distribution! Of course, *someone* won't be making any new purchases, will he? As a matter of fact, Anna Nicole is already a member of my unwatched pile, thanks to a good friend here who mailed a copy to me. I mean, the one with Eva-Maria. As for Anna's Anna, of course this would fall under the same exception above, regarding Salome. Any new release displaying Anna's cough cough assets would fall under this exception. But I'm not buying ANY opera that does not have Anna's assets until my UWP is down to zero! Unless of course my wife accepts to raise my debt ceiling. For heaven's sake Alma you've seen one of Anna's assets. Do you really have to have a matching pair? Move on. Well, Nat, a Salome would show many more assets. Does anyone know what the deal is with the Zurich Fidelio DVD? (You know, the one with HIM in it) I finally decided to buy it (since I only own 4 operas, guess which ones they are, and I want something new) and amazon gave a ship date in the middle of September. So I canceled and thought I'd try a private seller but no one had a 100% rating. Then I had a brainwave and thought I'd try Barnes & Noble. Placed my order, they said it would ship out on Monday, then they emailed me--oops, we're sorry, we're canceling your order. Another brainwave and I tried amazon.de, they claimed to have it in stock but when I got to check out it was going to cost over $60!! I love el Guapo but that would buy a couple of Met in HD tickets. So I went back to amazon and ordered it again. Delivery estimate Sept 20th. This New Town Videos that has it, ships within a day (Amazon ships within 1-4 weeks) and has 96% approval over 265,000 reviews is a rather safe bet in my opinion. I haven't bought from them, but 96% of 265,000 is pretty good, there are always disgruntled customers who post bad reviews because of minor things, you have to think that one quarter of a million people are satisfied customers of this business. Thank you, kind Alma, I'll toddle over and do that. Well so much for that idea. Newtown videos has now cancelled my order. So I still have an order with amazon.com that supposedly will ship towards the end of September. We shall see. I'm not getting this at all. Maybe there is some kind of rights thing going on. How about Presto Classical? Fidelio. They are always very reliable and it's in stock. Thanks, Natalie! I went ahead with them--fingers crossed!!!. They were not nearly as expensive as amazon.co.uk or amazon.de who also claim to have this in stock! I like that their confirmation email says they will despatch the next working day, and actually invites me to contact them with any questions. That's certainly much more transparent than amazon! Thanks again Natalie! Just received an email that my order has been despatched by Presto! So I can cancel my remaining ill-fated amazon.com order. Yippeee! Welcome to the forum, Adele. I hope you will continue to visit us! A little background, just because I can't resist sharing it. Opera has been an important part of my adult life, (30+ years). However, some four years ago, I met for the first time and became close to my four slightly older half-sisters. We shared many things, but opera wasn't one of them. So, you know what comes next. Recruitment.... recruitment... But, I'm a little cautious and shy, and didn't want to rush in and oversell things. I worried a bit about Il Trovatore--much as I love it, it wouldn't have been my first choice for an opera newcomer. But, you have to work with what the season offers. Okay, her first question when the lights came on was: "When's the next one?" Die Walkure! She sniffled through Wotan's farewell. She loved it. So, at this time, she's making plans to rearrange her schedule to accomodate ALL of the Met 2011-12 season. That's a slight moment for me, since, left to myself, my budget wouldn't run along those lines, to say the least. I'll manage, though. Now, I get to the question. Obviously, I have Christmas solved. The basic what-to-get concept, that is. However, lots of challenges with the details.... My plan is to buy her a DVD of Carmen. I think the obvious choice is, either the Elina Garanca one--since she loves the filmed performance concept, OR the reissue of the Domingo/Migenes film. On the other hand, my sister's thoughts have turned eagerly toward recruitment--remember, we have three unconverted sisters.... To quote her, "How could anyone NOT love this, if they just tried it!" So, that Domingo/Migenes film might be the perfect way to reel in our "never tried an opera and knows she wouldn't like it" sister.... since it's filmed like a musical. P.S. Whew--I didn't realize I'd talked so long, till I posted it. Cool story, Ana! I'm all in favor of recruitment. Once we get a large enough army of devoted opera lovers--and with this ring of absolute power I'm wearing--we'll be able to take over the world! 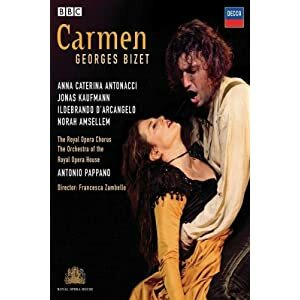 Not to complicate matters further, but I'm wondering if your half-sister(s) might like our TC Recommended Carmen, the one with Jonas Kaufmann. If anyone can convert a group of women to opera, it's him.